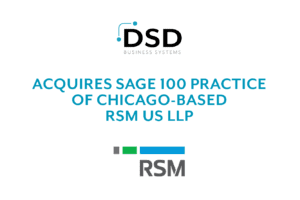 San Diego, CA: DSD Business Systems, a leading VAR in the ERP, Accounting, HR software and Enhancements sectors, has announced the acquisition of the Sage 100 Practice of RSM US LLP based in Chicago, IL. RSM’s Sage 100 Practice has been in existence since 1991. With the goal in mind of divesting their Sage 100 business, RSM held a strong portfolio of over 125 Sage 100 clients. The merger expands the Sage 100 resources and skilled professionals available to service Sage 100 and related products. “Expanding our practice to the Midwest region with the great history of service RSM US LLP brings has been a great step for DSD Business Systems. We are especially excited to have the top talent and experience that Steve Pavell and Jim Petrie from RSM US LLP bring to our team of experts. Steve Pavell previously with RSM US LLP, is also excited about the business move. RSM US LLP headquarters is located in Chicago, IL. The company has been in existence since 1926, originally founded in Cedar Rapids Iowa. RSM US LLP is now a $2 billion accounting, tax and consulting firm focused on serving the middle-market.